Reeling: Misadventures in Moviemaking, Money and Love offers hope for healing from an all-too common experience of women in media and entertainment. The hilarious and profound guide book for the #metoo movement! 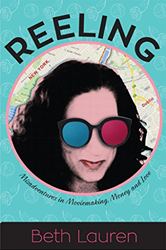 Beth Lauren makes her literary debut with Reeling: Misadventures in Moviemaking, Money and Love - a deeply moving, and at times, harrowing account of her multi-year journey to produce a romantic comedy; an experience that unlocked memories of the sexual assault she survived so many years earlier. This debut novel gives us a glimpse into how the #MeToo movement has affected all of us, and what some of us must do to heal and maintain our sanity. With her unique blend of wit and candor, Ms. Lauren takes the reader on two different but equally compelling journeys-one the riveting truth of the matter, as Beth seeks justice and pursues healing for her mind, body and soul; the other an imaginary path, as Beth channels her screenwriter's eye into a cinematic alternative history. This innovative hybrid memoir-screenplay is a romance any lovelorn woman or man can relate to, a tragedy any survivor can draw inspiration from; and a comedy with laughs for any reader on every page. “I hoped that sharing my story of remembrance and recovery would help other women to heal. The writing and publication of my memoir coincided with the birth of the #MeToo Movement. The bravery my fellow survivors have shown by telling their stories publicly has given me strength.” Ms. Lauren said. “Reeling by Beth Lauren encapsulates what so many in the #MeToo movement have come to feel—women are a force to be reckoned with. With wit and an engaging prose style, Beth Lauren makes that clear!" said Avi Gvili, President of Boulevard Books.